I believe that the ultimate goal for most Tarot readers is to feel connected with both the cards and our intuition. 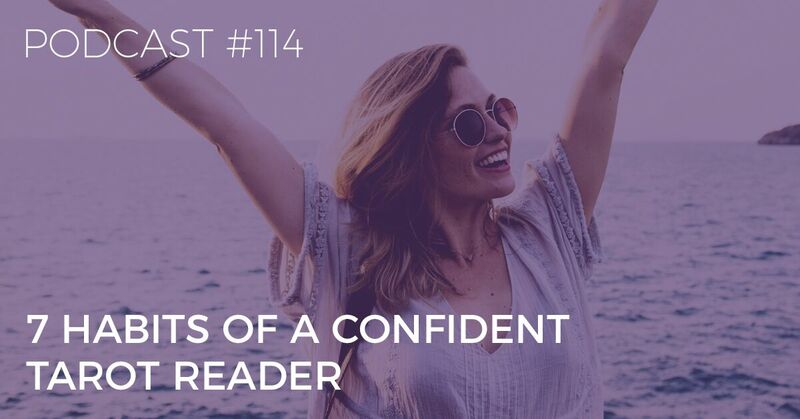 In Episode 114 of the Biddy Tarot Podcast, I share with you the 7 habits of a confident Tarot reader, so you can feel great when you sit down with the cards and deliver valuable readings! You’re listening to the Biddy Tarot Podcast, and this is Episode 114: 7 Habits of a Confident Tarot Reader. Hello, and welcome back to the Biddy Tarot Podcast. As always, it’s my absolute pleasure to be chatting with you all about Tarot. Now, before we get into today’s episode, which is “The 7 Habits of a Confident Tarot Reader,” I just want to do a shout-out to one of our podcast listeners. Her name is—well, I’m going to assume she’s a she—MysticCreation from the U.S. MysticCreation has posted a five-star review, and I really, really appreciate it. Well, thank you, MysticCreation! I totally, totally appreciate. How cool you’ve done over 100 episodes in two weeks! That’s pretty amazing. So, of course, if you want to leave a review and a star rating, please do so over on iTunes. It also helps us get Tarot out into a much bigger audience as well. People who might be looking for podcasts on intuition might just come across the Biddy Tarot Podcast. Awesome. Well, let’s get into today’s podcast episode. It’s all about the habits of a confident Tarot reader. Now, I kind of think that our ultimate goal is to become a confident Tarot reader so that when we’re laying down the cards, we feel confident, we feel awesome, we feel connected not just to the cards but also to our intuition. So, what are the 7 habits that create that confidence? And how can you start bringing those 7 habits into your life? Well, that’s what today is all about, so let’s get straight into it. Number one is know your value. What do I mean by this? Well, I know that when I first started reading Tarot, I seriously just thought I was having a little bit of fun. I was pulling out the Tarot cards and just seeing what would come up. I really didn’t read too much into it, and it didn’t really play much of a role in my life in those first few months because I thought it was just a fun party trick. But as I started to get into Tarot a lot more, I started to realise that there was a lot more value in these Tarot readings than I realised. I absolutely stand by the value that is in a Tarot reading. In fact, I stand by it so much that, if people challenge Tarot and say, “Oh, it’s a load of B.S., and it’s just all made up,” then I can totally stand my ground now, particularly as a confident Tarot reader. I can stand my ground, and I, fundamentally, hand on heart, say what the value is of a Tarot reading. That is, it’s here to serve us. It’s here to reflect parts of our subconscious back to us so that we can bring our subconscious into our conscious mind, and then, once it’s in our conscious mind, we can take action on that. And to me, that is incredibly valuable. It doesn’t really matter how Tarot works or doesn’t work, or whether it’s really or it’s not real. That part actually doesn’t really matter. It’s about what happens or what the end result is from a Tarot reading, and that is often that people are changing their lives for the better as a result of the messages and the intuition they’re receiving through a Tarot reading. So, to be a confident Tarot reader, know your value, and know the value of your Tarot readings. Number two, trust your talents. Now, when I first started reading Tarot, I thought I had to be psychic. I thought I had to be able to have visions. I thought I had to be able to hear things. I thought I had to be super exact. I thought I had to predict timings. I thought I had to do so, so many things! In this constant place of striving towards something that I thought was expected of me, what I forgot was that I had my own unique talents that I could bring to the table as a Tarot reader. What I’ve started to realise more and more, and the more I work with Tarot, is that there’s something special and unique about each and every one of us as we use Tarot in our practice, and there’s not really a generic way of reading Tarot. For me, I like to integrate some of my neurolinguistic programming skills into a Tarot reading. I like to integrate what I know about business and career. I like to integrate what I know about spirituality and just general psychology as well, and I bring that into my Tarot readings, and those are my natural talents. Now, you might pick up the cards, and you might be someone who is really good at telling stories, so your natural talent is creating the story from the cards. Or maybe your natural talent is that you do have those psychic abilities, and you see things with crystal clarity, and you can bring that into your Tarot readings. So, to be a confident Tarot reader, you need to know and trust your unique talents, and don’t try to push yourself to be something that you’re not. Don’t think, “I’m not good enough because I’m not psychic enough,” or “I’m not intuitive enough,” or “I’m not a good enough communicator.” Well, phooey to all of that! I want you to focus on what you are great at and what makes a Tarot reading with you special and unique. Number two is trust your talents. #3 MEDITATE AND TUNE IN. All right, number three! The third habit of a confident Tarot reader is meditate and tune in. In order for you to really connect with your intuition every time you pick up the Tarot cards, it’s incredibly important that you know how to turn off your conscious mind, your ego, your fears, your anxieties, all the chitter-chatter that goes on, and switch on your intuition instead. The way to do that is to practice meditation regularly and to also practice tuning into your intuition. If you go into a Tarot reading with all that chitter-chatter going on in your head, and you haven’t had the time to pause and clear out first, then your Tarot reading is not going to be as clear as it could be. Do the practice of daily meditation, so you develop that skill and it comes to you easily when you’re about to do a Tarot reading. That was the third habit: meditate and tune in. Now, let’s focus on the fourth habit of a confident Tarot reader, and that is ditch the rule book! Now, the first rule about Tarot is that there are no rules—that’s for sure. The only rule is, really, to be ethical, but that’s just a good life rule anyway. You might hear all sorts of rules about Tarot, but they are not really rules. It’s just somebody’s opinion or someone asserting their own authority and power. The beauty about Tarot is that you can make it what you want it to be. If you want it to be part of something more occult, you can. If you want it to be purely positive and radiant energy, you can make it that! If you want it to be about predictions, go for it. If you want it to be about life coaching, it’s all yours! It’s whatever you want it to be, and there really are no rules. In fact, when it comes to Tarot card meanings, for example, it’s a wonderful thing if you can ditch the book and learn how to trust your intuition instead because, once you let go of having to memorise all of the meanings, you can then connect much more deeply with your intuition, and you’ll see it come out in your readings in really, really beautiful way. So, don’t be limited by what you think are the rules of Tarot because—I’m going to break it to you—there are no rules of Tarot, except just do no harm, right? Number four, ditch the rule book. All right, number five is practice self-care. I tell you what—this comes up in so many different areas. Basically, you need to take care of yourself so that you can care for others. If you go into a Tarot reading, and you’re a hot mess, you’re frazzled, you’re stressed out, and you’ve got your own problems to deal with, you are not going to give your absolute best in that Tarot reading. In fact, it’s much better even if you cancel that Tarot reading and focus on your own self-care first before helping others. Tarot readings just bring so much of you into that experience that you’ve got to have you in the right place. If you’re going through a tough time in your life—maybe a few months or a few years where you’re just trying to get things together for yourself—take that time to do that, rather than trying to force yourself to read Tarot for others or pursue your business or what have you. The self-care piece is so important so that you can do a great job as well. And, you know, the self-care goes through to believing in yourself and having confidence in yourself. If you’ve got any fears and anxieties that are coming up regularly about your Tarot reading practice, then that needs work. You need to focus on that before you can give your absolute best to someone else in a reading. That’s number five: Practice self-care. #6 CREATE MAD LOVE MONDAYS. All right, number six is create “Mad Love Mondays,” and I have Laura to thank for this because I just noticed one of her hashtags was #MadLoveMondays. Laura is our Customer Happiness Manager and Community Manager as well. What are Mad Love Mondays? Well, start your week with a review and a refresh of all of the beautiful feedback you’ve ever received as a Tarot reader. What this does is it starts your week in a really cool way, and it also just reminds you of how awesome you are. For whatever reason, we do this weird, crazy thing where we might get 99 amazing bits of feedback, and we get one not so good feedback, right? What do we do? We focus on that one bad thing. We think, “Oh, my gosh! I’m terrible! This is really bad!” and we get all stuck in our fear and anxiety again. But the idea of Mad Love Monday is to focus on those people love the work that you do, and that will boost your confidence like nothing else! Set aside even just 10 or 15 minutes on a Monday to go through your very best feedback, and remind yourself of how cool you really are, especially when it comes to reading Tarot. That’s number six: Create Mad Love Mondays. And that’s what I love about Tarot. You never stop learning. It’s just a constant flow of new information, new insights, new connections. It’s absolutely beautiful. So, a confident Tarot reader, you’d think might think, “Maybe they’re the expert. Maybe they know everything.” But I believe a confident Tarot reader is always learning. They’re always looking for new opportunities to expand their knowledge and their experience and their practice and so on. If you want to step into that role of being a confident Tarot reader, think about how you can also be learning in the process. And look, it doesn’t have to be necessarily learning Tarot skills. I can be learning life skills that you can then integrate into your readings. I actually think the best books for learning how to read Tarot are the ones that aren’t about Tarot. I think the really good ones are the ones that are about spirituality or life skills or relationships or career because that will help you in your Tarot readings. Always be learning not just about Tarot but also about just general life strategies, and that will greatly improve your confidence as a Tarot reader. That was number seven: Always be learning. Do those 7 things, and you will quickly become a confident Tarot reader. Amazing things will happen for you because you’ll be putting yourself out there in such a powerful way and helping and serving so many people while trusting your intuition and giving value and just being awesome, basically. That’s it! All right, well, I hope you’ve enjoyed today’s episode. It’s been an absolute joy to share these habits with you, and I hope that you can at least take one of them and bring more of it into your life. Have a really awesome week ahead, and I look forward to connecting with you again very, very soon! 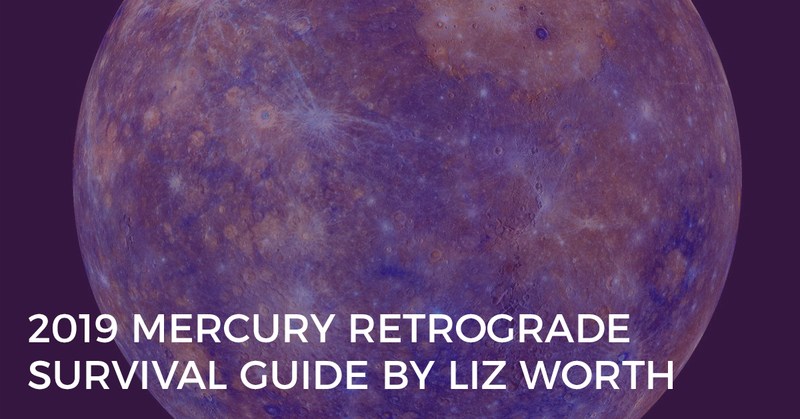 And remember, you can always get the show notes and the transcript for today’s call at BiddyTarot.com/114. Bye for now! 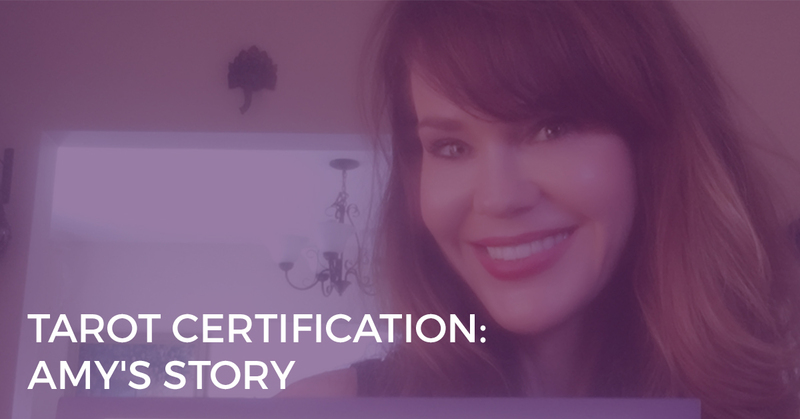 If you want a deeper dive into becoming a confident Tarot reader, I have the perfect free training for you! 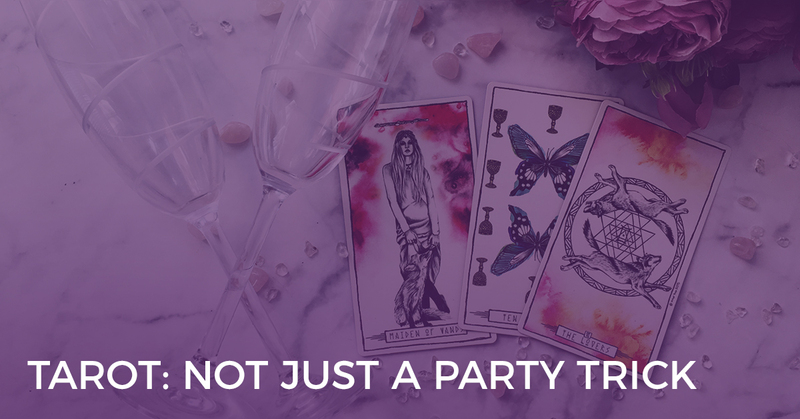 Learn the fastest, most effective ways to become a confident Tarot reader who client rave about, when you join the waitlist for the Biddy Tarot Community.